Well I guess it is time to get my book out in the public eye. So, I will start posting parts of my book, when I can. Let's see if this works. I started working on this book in December 2009. By December 2010, I had a copy ready to print. Paladin Press in Colorado, USA was interested in printing my book once I signed over all my rights. At this time I still do not feel inclined to give up on having my book published. But, I prefer to have it published on my terms. For example, I do not want to lose my rights to this material. But, if you promise not to try to steal my material and call it your own, I will start to post the book in pieces on my blog. I wrote this book because every brochure you ever read tells you to make a plan. But no one ever shows you what the plan looks like. 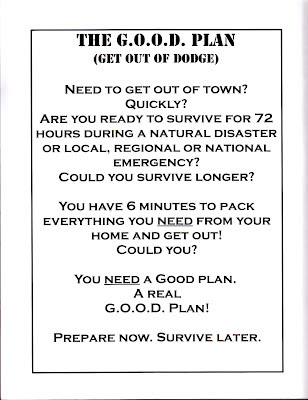 This is not a survival manual per se, more of a manual to plan your family's evacuation, should you ever need to. I hope this is of some assistance. This is copyrighted material. I am the copyright holder. I am extending viewing privileges to you the reader. You may read this but you cannot copy this material and reproduce it and sell it. You cannot take it to the printer and have it printed. IF, any publisher would like to work with me to have a printed version made, please, email me at: thegoodplan@hotmail.ca . Thank you. Mountainman aka V. Andrew McMillan. Sorry Folks, could not get my cover to paste. So, we carry on. I may have found copies of my Cover and Back Cover to post: Fingers crossed this will work. Yes!! This book is dedicated to the late Mr. Fred Allan, my English Instructor from Grade 8 to Grade 10 at C.S.S. Thank you for pushing me when I needed a push. I will be the first to admit I was not a strong English student. Thanks to your mentoring my writing skills improved. I wonder if you would be surprised that I have written a book? Rest in Peace. Thanks again. This is my first attempt at writing a book. This particular book, The G.O.O.D. 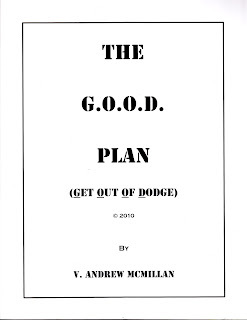 Plan (Get Out Of Dodge), could have been written by any number of current or former military persons. But, I guess it was left for me to write. I hope I have done this topic justice. Planning to evacuate is easy to say, but it is a whole lot of work to build a successful plan. The author would like to be forgiven for being belligerent at times. This writing style was chosen to drive home important points of survival. Situations that cannot be imagined in our day-to-day lives, must still be prepared for if society dissolves or during a crisis situation. The author would also like to recognize that the group most likely to purchase this book, is most likely the group that needs this information the least. So, please help those that need this information the most, give them a copy or lend them your copy. Welcome to the G.O.O.D. Plan. If you are reading this you may foresee a need to GET OUT OF DODGE and you want to know how to prepare for that day. The G.O.O.D. Plan is an evac plan. It will be part of your family's emergency preparedness plan. These days we are faced with threats to our freedom and safety from every side, be it, religious extremists trying to share their suicide bomb with us, dirt bag criminals trying to rob us blind (or worst), or unstable governments losing their nuclear weapons to terrorists. Today is a dangerous place for law abiding, peace loving citizens. So, what is a good guy to do? Well, first you have to be skeptical of the world around you, quickly followed by being skeptical of the information you receive about that world. Is the source trustworthy? What angle are they providing the information from? Who benefits? You the viewer? Or some corporate client? Additional information is provided to help your planning process. Including sample scenarios, gear lists, threat assessments, possible terrorist targets and a sample G.O.O.D. Plan. The G.O.O.D. Plan requires you to have solid information from a trustworthy source. To Get Out Of Dodge, you need to be on the road before anyone else knows there's a problem. 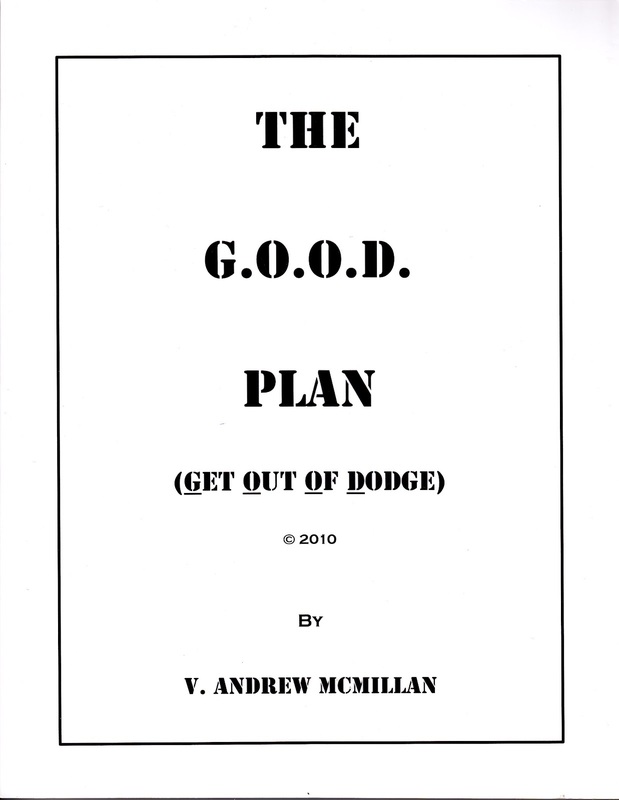 Get Out Of Dodge – A phrase from the Wild West. Meaning to leave town before the shooting started in Dodge City. P.O.L. Point – P.O.L. (petroleum, Oils, & Lubricants) storage point. Best made with a bermed earth bank around the perimeter & lined with heavy plastic. Jerry cans should sit in drip pans. Drums & barrels should sit on stands with drip trays under spouts. Assorb-all available for spills. Fire extinguishers and shovel at fire point close by. Billy Can – A Billy Can is a large metal. It can be used to boil water, melt snow or heat soup, stew or coffee. A heavy gauge can, such as a 100 oz ketchup can. A lid from a large coffee can makes it more useful. The addition of a pot gripper completes the Billy Can. This removable handle makes moving or pouring much easier. Opsec – Operational Security. Need to know, others are not told. “Loose lips, sink ships” Effective Opsec keeps you and your family invisible, which is good. GMRS – General Mobile Radio Service. Compact 2 way radios. Channels 15 – 22. 1.0 – 5.0 watts. FRS – Family Radio Service. Compact 2 way radios. Channels 1 – 14. 0.5 Watts. Short range radios. VOX – Voice Activation System. With headset, allows hands-free radio operation. Very useful on foot patrol or convoy duty. This is the part of converting gut feelings and accurate intelligence into a time to act. There are no guarantees in life, lest of all when your and your families lives are on the line. The importance of good, solid information can not be overstated. When the time comes, you will know. You will be ready. You will keep gear in your vehicle. You will keep your vehicle's fuel tank at least half full at all times. 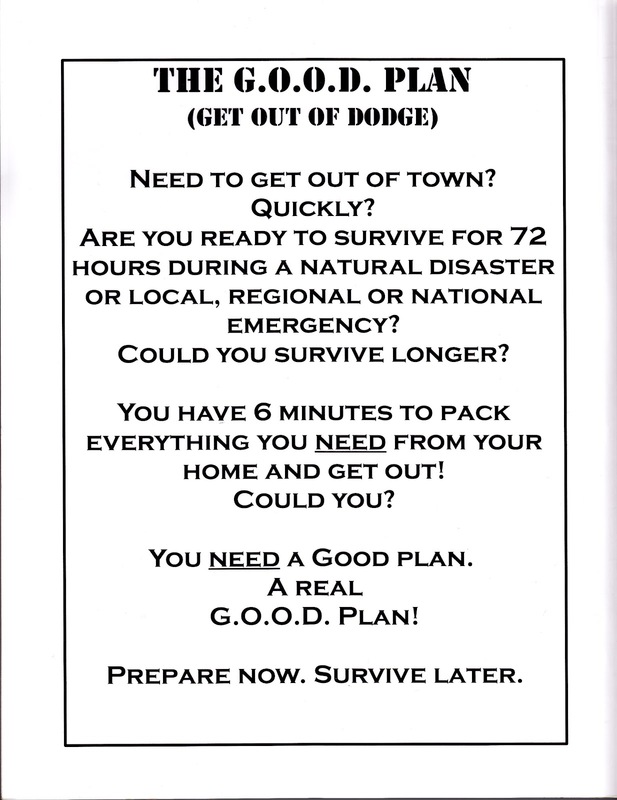 You will have an escape pack for each member of your family ready incase you have only minutes to evacuate your home. I know this, because you are reading the G.O.O.D. Plan. You are reading this because you want to be prepared. You just need a little push in the right direction. You are planning and have been for a while now. You want to get yourself organized and ready. That time is NOW! Time to enact the G.O.O.D. Plan is when civil order is just on the verge of collapse. The trigger event is not important, it can be a natural disaster or a man-made tragedy. Time is your greatest challenge. If you have enough warning you can survive any event. The challenge is being able to succeed when there is not enough time. That requires pre-planning and preparation. You have to be ready before there is an event to prepare for. The G.O.O.D. Plan can be tailored to meet your needs. Are you solo or do you have a wife and kids? Is there an extended family member to care for? Or are you a member of a group or community that plans to tough out whatever comes, together? The tailoring process can also be done as your needs or commitments change. You can grow your plan from yourself, to when you get married, when you have children or are caring for a parent. It is a lot of work to build the perfect plan. too bad, the perfect plan rarely works perfectly. Start today, and you can have a G.O.O.D. Plan in a few hours. These will not be easy hours, but when the chips fall, these hours could be worth your life or your family's lives. Enough talk, let's get some action! This is what you are doing right now. You need to know what to do in any natural disaster that may strike your neighbourhood. You need to know what to do in the event of a man-made disaster. And, you need to know what to do in the event that a war-type incident breaks out near you. You also need to scale your plan to the number of people it will include. You can just multiply the individual gear for each member or you can have a base amount of personal gear and share the group gear split equally between each member of your group. You also have to determine the worst case scenario. If your worse-case scenario is a planet killing asteriod impact on the planet earth: your plan may just be to get the family together for one last BBQ and a few (a lot of) Beers. Next your plan needs to determine if you will shelter-in-place or escape to a safe zone. Where would your safe zone be? Is it a safe distance from where you currently live? Have you moved to an area, that allows you to shelter-in-place so, your home is your safe zone? Do you have the supplies of water, food, fuel and defensive stores to protect your supplies from looters? Do you have shelter from the elements? How about shelter from fallout or other forms of radiation? How long will your water and food supplies last before you need to replenish them? Where will you get more supplies from? What if the government is not able to help the citizens of your country? These are tough questions. If you are thinking about them now, you may have a plan to solve these challenges before they drop in your lap. That is the largest part of the planning phase – think about what obstacles will be in the way of your survival. As you can see the G.O.O.D. Plan contains a lot of personal and confidential information. Some of this information will not want to end up in the wrong hands. The criminal element will use this information to rob you blind and the law enforcement agencies would throw you in jail for planning to deal with trouble during periods of extreme lawlessness. So, my recommendation is once you and your family have made your plan, keep it safe and secure. Review it at least once a year. Update it as needed. Keep it current, because when you need this plan to work you will not have the time for updates. This is a subjective area. The reader will have to use their personal knowledge of their climate, terrain, and seasons to modify the following lists of equipment. These lists will try to address the needs and give specific examples. The extremes between summer and winter will mean long lists. The most important aspect of items is to satisfy more than one need or feature. Versatile and durable are key. When creating your escape pack try to acquire the best quality items you can afford or build at the time. Upgrade on an as you can basis. In this game, quality matters. Your life depends on the item to work when you need it and there is no going to the store to exchange it for one that does. Boots – Sturdy. Danner's. Bate's. Matterhorn's. Jacket or Anorak – Gore-tex shell + Light warm liner. Fleece. Boonie Hat – for sun and rain. Toque – for cold and snow. Balaclava if in the North Country. Gloves – Leather. Shooting. Working. General Protection. Gloves – Fleece. Warmth. Dexterity. Mitts – Gore-Tex Shells. Wear over fleece gloves. Mitts – Down. For extreme cold. Sunglasses or googles – uv protection. Snowblindness. Food – For at least 24 hours. 72 hours is better. See appendix L – Cat Food Diet. Brew Kit – Tea or Coffee, sugar, salt & whitener if needed. First Aid Kit – Build your own or purchase a good one. Shell Dressings or Pressure dressings – Large x2. Water Purification tablets – x24 Tablets. Sleeping pad – 3/8” or 1/2” thick. At least 48” Long, 72” is Better. Must have in winter, cold climates, or at altitude. LED Flashlight or headlight – Use common batteries, AA or AAA or Lithium CR123A. Spare Batteries – use one common type if possible. Aa or aaa. Portable radio – am/fm/weather. Eton. Grundig. Crank-type. Solar type. Have common battery back-up. GMRS/FRS Radios – At least 2. For communication on the run. Multi-plier type tool – Gerber. Leatherman. Copy of ID: Driver's License. Passport. Insurance. Credit cards. Birth Certificate. Marriage Certificate. Cash – $1, $2, $5, $10, & $20's. At least a few hundred in small bills or coin. Gold and diamonds are good, too. Prepaid Fuel Cards – Choose a common petro company along your G.O.O.D. Route. $100 worth, depending on route. Route Map(s) – Road and foot. Compass. GPS. Pencil. Ruler. Notebook – In Ziploc bag. Extra Ziploc bags – Medium. Large. Heavy duty freezer type. Pack all items in dry bags, garbage bags and/or ziploc bags; before putting into your escape pack. This will keep everything weatherproof until you need it. In addition, because everything is sealed, your pack will float. Water bottles in pouches on left & right sides of hip belt. You pack the same so you can find items in your pack in the dark. Also, in an emergency, you will be able to find the required items in your friends pack without a light or delay. Their life may depend on you finding the right item at the right time, so your life will depend on your friend finding the right item in your pack if the situation was reversed. Well that is it for now. Keep checking back. I will add more from time-to-time. The New Field Manual Edition should arriving soon.